Black Body and Sway Bar Kit for Traxxas XO-1 « Big Squid RC – RC Car and Truck News, Reviews, Videos, and More! There is some good news for all you Traxxas XO-1 Supercar owners out there, Traxxas has just announced a new pre-painted Black Body and a new sway bar kit for your car. The new black polycarbonate body is painted, pre-cut, and completely ready for installation. 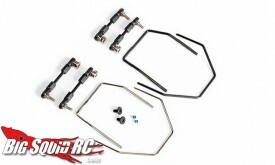 Also available is the new sway bar kit from Traxxas for your XO-1. The kit is fully adjustable and comes with everything needed to make the install easy. Retail price for the black body is $80 while the sway bar kit goes for $25. Hit up the official Traxxas Website for more information. THIS is the link you want for more Traxxas news right here on BigSquidRC.